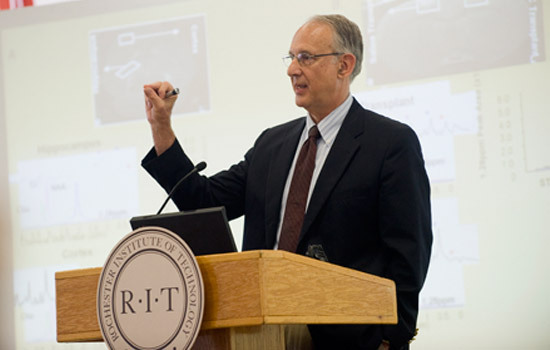 Dr. Fritz Henn, associate director of life sciences at the Brookhaven National Laboratory in Brookhaven, N.Y., was the keynote speaker at the second annual Graduate Research Symposium. Henn told students to find a research area that fascinates them. Paul Solt will present the application he’s created for the iPad this week at the SIGGRAPH Conference on Computer Graphics and Interactive Techniques in Los Angeles. Solt, an RIT computer science dual bachelor’s and master’s degree student, got the opportunity to show his mobile platform application to his peers and members of the Rochester community at RIT’s second annual Graduate Research Symposium on July 21. He was one of nearly 100 master’s and Ph.D. students from all eight of RIT’s colleges that presented their research at the event. Solt’s mobile application is called Artwork Evolution. It’s digital artwork for mobile devices using mathematical expressions. Solt ultimately hopes his application will enable collaboration among users and allow them the opportunity to pull images from others’ artwork to combine with their own, generating new genetic art. Students delivered research presentations during three symposium sessions. A broad range of topics was covered including freight traffic flows on the U.S. West Coast, the psychographic factors and use of interactive features on admissions websites by prospective students, optical time division multiplexer on the silicon chip and design for Lean Six Sigma. Christopher Bailey, a Ph.D. candidate in microsystems engineering, served as the symposium chair. He says the symposium is a day of interactive learning. For Henn, studying the brain, specifically its affects on depression, is what fascinates him. The symposium was streamed live. Event sponsors were Corning, IEEE, Department of Networking, Security, and Systems Administration, RIT Student Government and the Office of Graduate Studies. To learn more about the symposium, visit http://gradstudies.rit.edu.